Following Malawi under-23’s 1-0 loss to Zambia at Kamuzu Stadium yesterday, one would have expected gloomy faces from fans, but instead it was business as usual as they trickled out of the stadium with reckless abandon—a clear sign that they are now used to such disappointing results. On a rainy mid-week day, the turnout was not bad at all and the drenched fans were rewarded with some flashes of brilliance from the junior Flames in the first-half as the two sides battled for a place at Egypt 2019 Africa Cup of Nations final. But, as usual, a late goal from Belgium-based forward Fashion Sakala in the 76th minute reminded the fans that some things will never change. Coach Meke Mwase employed a brave system throwing Dennis Chembezi, Hadji Wali and Trevor Kalema in defence. Precious Sambani was meant to operate on the left wing while Isaac Kaliyati was deployed on the right side. Captain Chimwemwe Idana played the holding midfielder role with Levison Maganizo attacking in front of him. Upfront Mwase had Hassan Kajoke playing as lone striker while Peter Banda and Mike Mkwate supported him as wide attackers. At first, the system seemed to work as the lone striker found himself supplied with balls from the midfield. 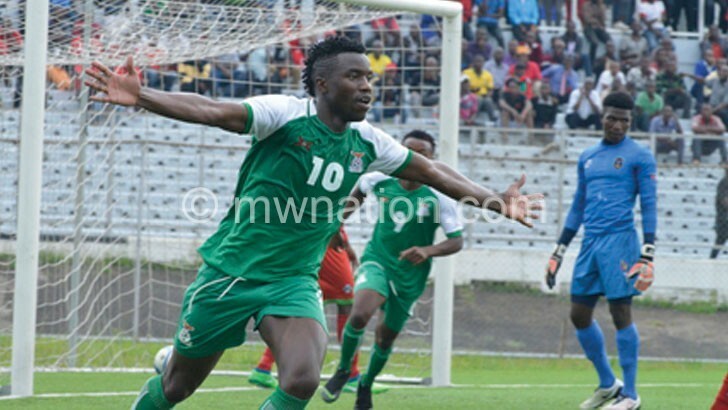 But he wasted the chances shooting wide twice with just the Zambian goalkeeper Mangani Banda to beat inside the first 10 minutes after being played in by Banda and Kaliyati. Mkwate was also denied from close range by the Zambian keeper after the Bullets midfielder initiated some neat passes from outside the boxing into the danger zone. The Zambians on the other hand, preferred to stay in their half as they studied the junior Flames’ Achilles heel. The visitors finally showed what they were capable of in the 44th minute then Sakala played in Austria-based Patson Daka but Munthali left his line to stop his initial shot as well as the rebound. In the second-half the tide continued to turn against Malawi. Mwase responded by pulling out Mkwate and introducing Patrick Phiri while Francis Nkonda came in for Maganizo. However, the changes did not stop the victors from spoiling the hosts’ day. In 73d minute, Malawi survived a scare when Sakala rounded off Munthali but his shot bounced of the post. Malawi’s luck ran out three minutes later when Sakala rose to glance in a corner kick. The visitors almost doubled the lead in the 85th minute but thanks to Kalema who glided to clear the ball off the line after Daka capitalised on poor coordination between Munthali and his defenders. In post match interview, Mwase admitted that they had made things tough for themselves by conceding a goal at home but promised to come out strong in the second leg in Lusaka on Sunday. His counterpart Beston Chambeshi said he expects an open game in the second leg. “It will be a good game. We expect Malawi to attack all the way,” he said.